We are dedicated to saving the Luna because by doing so, we save more than a beautiful harbor tug that was a "first" and is now a "last surviving" in technology and material. We want to save the Luna because by doing so we save Bostons link to the history of its commercial port and the culture, commerce, sights, and sounds of this great citys development. The Luna also embodies some of the most important technologies that defined the 20th century: the internal combustion engine and the control of electrical power. 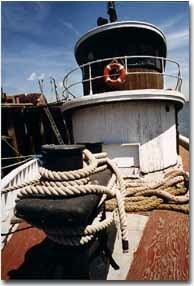 And if that isnt enough, everyone  young and old  loves the jaunty, helpful profile and allure of a working harbor tug. Children and adults alike find it more and more difficult to connect to the real and physical world, to see and think about work, trade, technology, and the way the forces of nature, science, technology, commerce and culture intersect. The Luna can be an important connection between the cyber future that our children face, and the values and lessons of the past. To the maximum extent possible, we want to involve school children in the rehabilitation and presentation of the tug. In this way, children will learn to give, learn to see more in the world around them, and find new and important lessons in the history, geography, ecology, and activity of Boston Harbor  their harbor!